Here are two common challenges when building online training courses: knowing what content needs to be in the course and then having the right visuals to support the learning of that content. 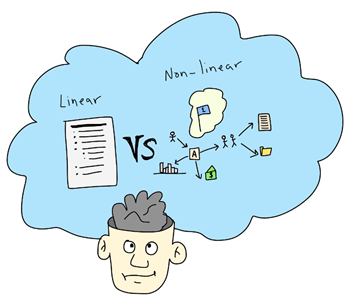 One way to overcome these challenges is to increase your visual thinking skills. You’ll learn to focus on the right content and then find the right visuals to support what you’re teaching. 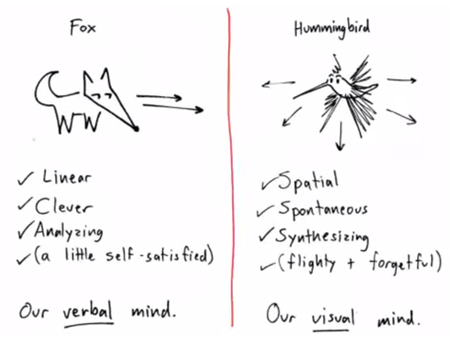 Dan Roam does a nice job drawing a distinction between our “verbal” and “visual” mind by using a fox and hummingbird analogy. And this is where visual thinking is relevant to elearning: most elearning is on the fox side of things. We’re info-centric and lean on our verbal minds to push out information. Yet, elearning is a mostly visual medium. So it’s ripe for us to use our visual minds to present information and concepts in a way that’s less dependent on text. This helps us move past bullet point lists. 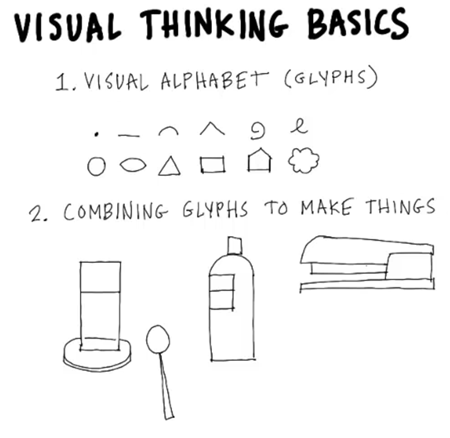 There are all sorts of great resources on visual thinking. Below are some videos to get you started and a few good book recommendations for those who want to dig deeper. 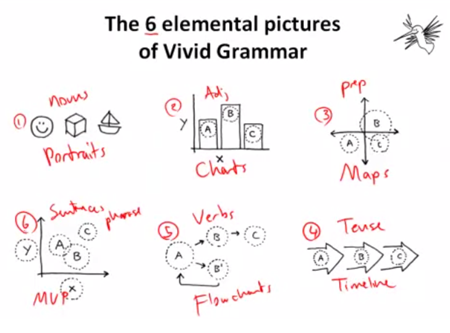 In the videos below, both presenters share how to get started with basic shapes and a consistent approach to capturing the big ideas and concepts. The videos also complement each other because while they’re similar they do use slightly different approaches. Of course there’s an investment of time watching the videos, however they’re not too long and you’ll learn quite a bit. Just treat them like a visual thinking workshop that you get to attend for free. I like the work Dan Roam does. Here are some free videos that are part of his Napkin Academy. 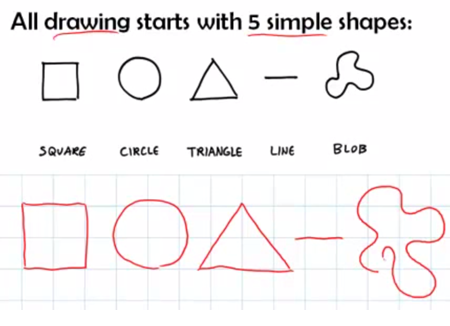 He shows how all drawings start with five simple shapes and also provides a grammar structure that guides what to draw. Here are three good videos by Dave Gray, founder of Xplane. He expands on Roam’s basic shapes using a visual alphabet (glyphs) and explains how to know what to draw and when to do it. I like videos, but I also like books. There’s something about holding them in my hand and making my own notes in the margin. 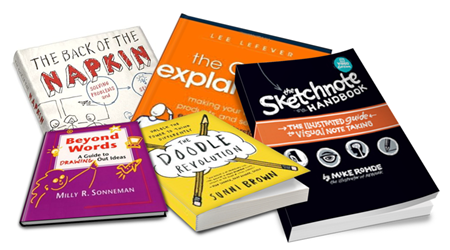 Here are some good visual communication books to add to your elearning library. Any of Dan Roam’s books are good. I haven’t read Show & Tell yet but I’ve heard good things. It’s on my list. 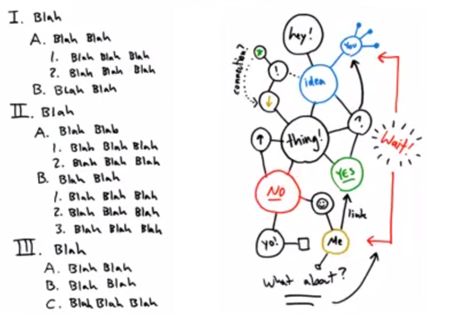 The Art of Explanation: Making Your Ideas, Products, and Services Easier to Understand. Many of you know Lee Lefever from his popular Common Craft videos. The Common Craft videos are a great transition from sketches to multimedia learning and there’s a lot to be gleaned for us elearning designers in the way the videos are clear, simple, and entertainingly engaging. The Doodle Revolution. Sunni Brown does a great job getting us to think about doodling in a new way. I also love her practical challenge activities to instigate practicing what you learn. Here’s a great presentation that she gave at TED. 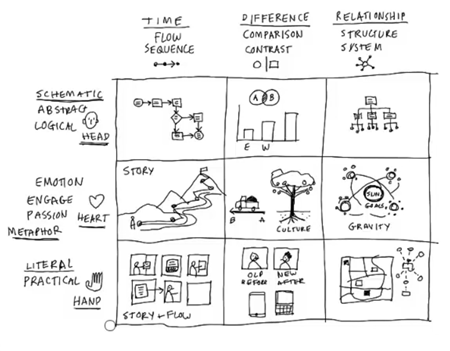 Guide to Visual Note Taking. Learn more about Mike Rohdes in this podcast and by reviewing some of his sketchnotes. This is one of a Lee Lefever presentation. Beyond Words: A Guide to Drawing Out Ideas. I haven’t read this book, but it came highly recommended from a couple of people at a recent workshop. The links to Amazon books may produce a slight commission. Watch the videos above to get a good overview of concepts. Practice sketching some basic shapes. I have an older tablet PC that I use with PowerPoint as you can see in this demo. Here’s a demo using OneNote which works a lot easier than with PowerPoint. For the image above and the header image, I used an iPad and Cosmonaut stylus. Convert a bullet point slide in one of your courses from fox to hummingbird. Don’t worry about being perfect. You’ll get better the more you do it. The key point in all of this is to train yourself to think visually. And then apply those skills to the construction of your elearning courses. Keep in mind, elearning is mostly a visual medium and unfortunately most courses are heavily text-based with deficient visual consideration. Thus, if you learn to think and communicate visually, you’ll only get better at building your elearning courses. 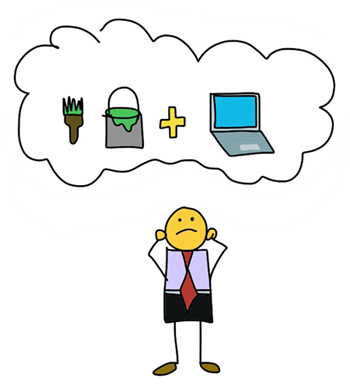 Have you applied any visual thinking concepts to your elearning courses? If so, I’d love to learn more about what you did. Thanks for writing this up. I can’t help but feel you have touched upon a subject that crosses over into the realm of graphic novels. I was just telling my coworkers the ideas you put forth are similar in many ways to what illustrators do when working from a written script or written novel to render a finished page or pages. I would also like to recommend Scott McClouds “Understanding Comics” or any of his other books to help with translating written text into dynamic images to tell a story in order to pass information or teach something. Will Eisner is a great source as well. I struggle with how to create more visual representations of the concepts I want learners to learn. Thank you so much. Tom, thanks for the visually appealing article and using more imagery and fewer words. As a former tech writer, I often find my even my minimalist tendencies conform poorly to ISD/Training. I have tried to incorporate more graphics and less “verbosity” into my lessons. I love the Back of the Napkin book too. I know some of our marketing folks use that. Cheers to you! This was an excellent article with great resources. I learned a lot. Thanks, Tom! Great blog! Those visual thinking and humming bird idea is brilliant. Thinking out of the box (out of the fox side) seems worth a try. I am currently pursuing a distance education course from a Business School . I had done my graduation course as a day scholar and had to suffer due to hectic timings and travel related issues. Now I feel relaxed and timings too are not a big concern when I opted for e learning. Apart from anything, an interest towards the subject is all that is essential. Most of the people leave the course due to lack of interest and time. I know some of the tricks for e learning like gamification and videos, and this one will now be an add on to my list. Thanks for sharing!